Just a bit of vocabulary! A plaintiff is a person who brings a case against another in a court of law. For example, the prosecutor, complainant, and accuser are all plaintiffs. A defendant is an individual, company, or institution sued and/or accused in a court of law. A complaint is a statement that a situation is unsatisfactory or unacceptable. A summons is an order to appear before a judge or a magistrate. Pleading is the action of giving an earnest to someone. In court you will usually plead innocent or guilty of a felony or misdemeanor you are being accused of. The pretrial conference is a meeting between both parties before a trial to outline the proceedings and define the issues to be tried. An arbitration is the use of an arbitrator to settle an argument. An arbitrator is an independent body officially appointed to settle a dispute. A trial is a formal examination of evidence by a judge, usually in front of a jury, in order to decide guilt in a case of criminal or civil proceedings. A verdict is a decision on a disputed issue in a criminal or civil case. 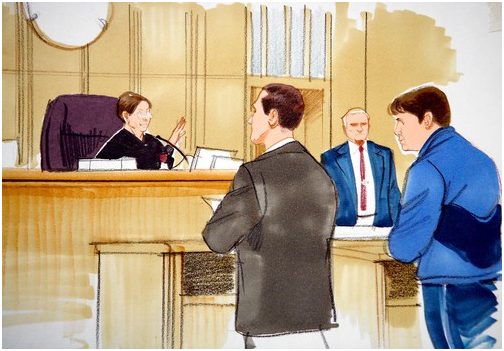 The preponderance of evidence is the greater weight of the evidence required in a civil lawsuit for the trier of fact (jury or judge without a jury) to decide in favor of one side or the other. An appeal is the process to seek and obtain a review and reversal by a court. The petit jury's verdict decides whether or not the defendant is guilty.